The Statesman newspaper is an English-language daily newspaper in India. It is published in Kolkata, New Delhi, Siliguri and Bhubaneswar. 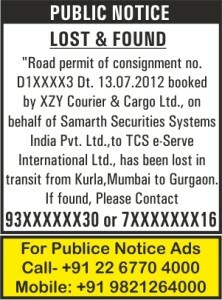 publicnoticeads.com is Advertising agency accepting the all types of advertisement in Public Notice advertisement in The Statesman Newspaper. Get Special packages & Discounted ad rates for Public Notice. Get your public notice Publish in Classified & Display of The Statesman Newspaper. publicnoticeads.com book all types of Public Notice Advertisements for the below sub-Categories for The Statesman Newspaper. 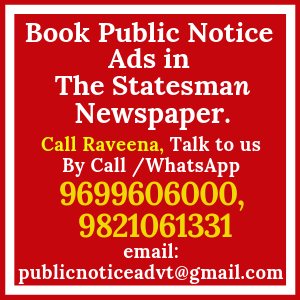 Below get the advertisement rates with editions for The Statesman Public Notice ads.